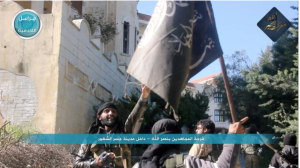 The Al Nusrah Front, al Qaeda’s official branch in Syria, and its allies have declared victory over the Syrian regime in the city of Jisr Al Shughur. The city was considered one of the regime’s last remaining strongholds in the northwestern province of Idlib. Late last month, the jihadists launched a major offensive in the province, sweeping Assad’s forces out of the provincial capital. 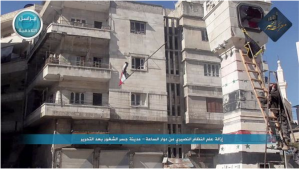 The battle for Jisr Al Shughur was the next major step in the jihadists’ plan to consolidate their control over the area. 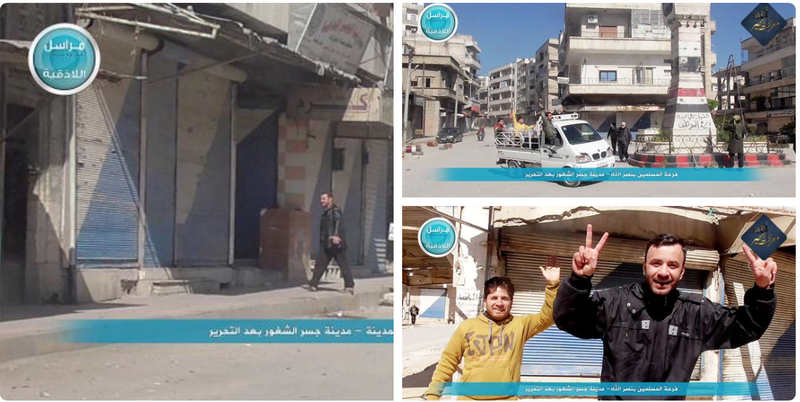 Al Nusrah declared “victory” on one of its official Twitter feeds, adding that the city has been “liberated.” Some of the photos posted on the Twitter page show al Qaeda’s fighters in control of the city’s center, the regime’s checkpoints, and a regime-built hospital. 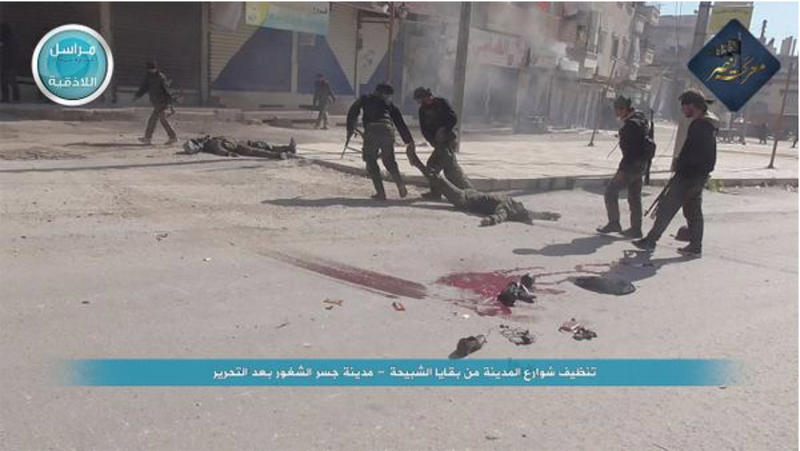 Al Nusrah uses another photo, picturing a number of bodies piled on top of one another, to claim that Assad’s forces committed a “massacre” as they fled the city. Multiple groups took part in the fighting. 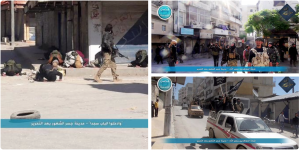 The jihadists established a coalition named the “Battle of Victory” to coordinate their efforts during a major push into the city. 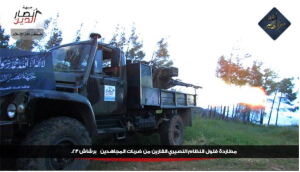 The alliance is modeled after the Jaysh al Fateh (“Army of Conquest”) alliance that overran the city of Idlib late last month, but includes a different configuration of groups. 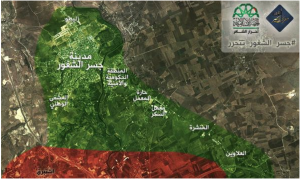 A map posted by Ahrar al Sham, which was seeded with al Qaeda veterans early on in the Syrian uprising, shows the jihadists in control of most of the city (green), with Assad’s forces being pushed to the city’s outskirts (red). 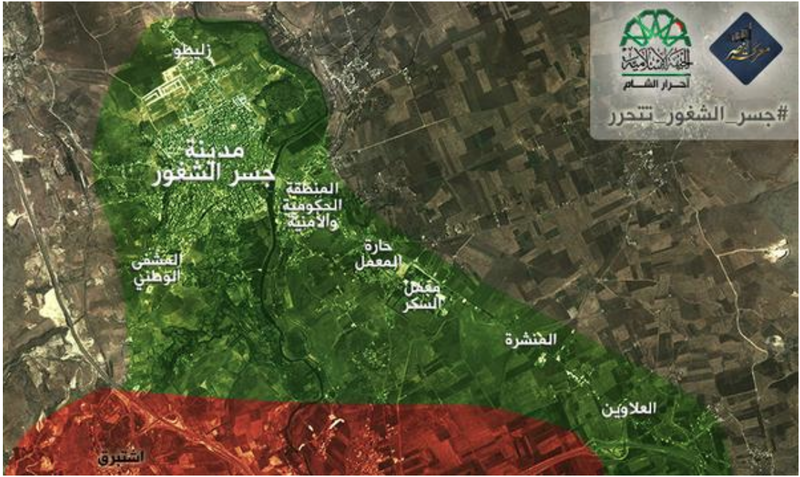 Ahrar al Sham’s map can be seen at the beginning of this article. 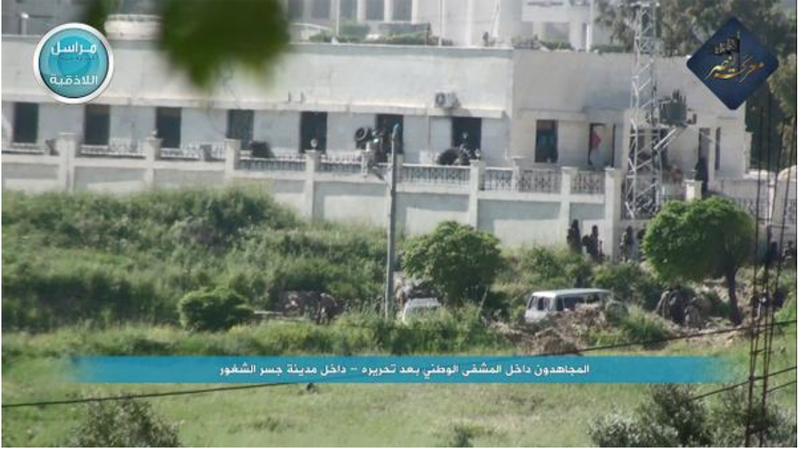 The group has also published various other images from the fighting. 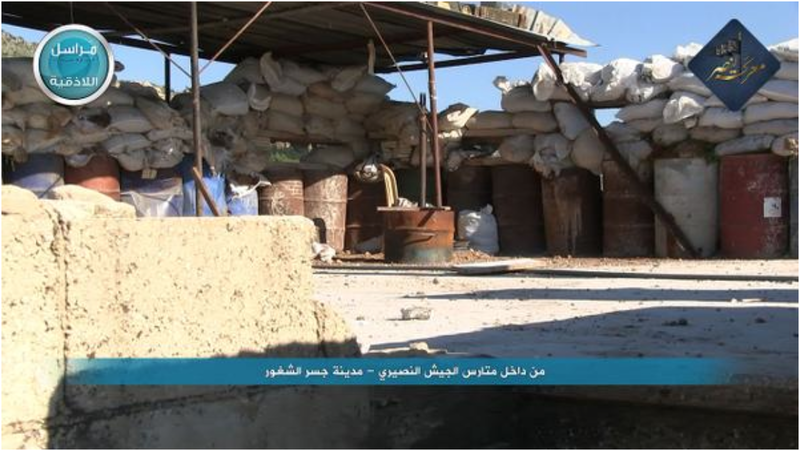 Ansar al Din, which was formed by several jihadist groups and is part of al Qaeda’s international network, posted several messages and photos from Jisr Al Shughur on its official Twitter page. In one tweet, the group said that “elements” of “Nusayri families” (a derogatory reference to Shiites) who support Bashar al Assad’s regime will be brought before sharia courts and treated according to Islamic law. In another, the jihadists claim they are preventing civilians, including children, from being harmed by Assad’s forces. 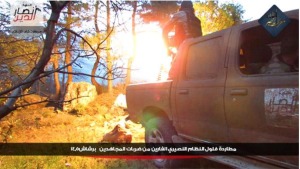 Two other photos (seen below) purportedly show Ansar al Din fighters hunting the “remnants” of the regime’s forces on the outskirts of the city. 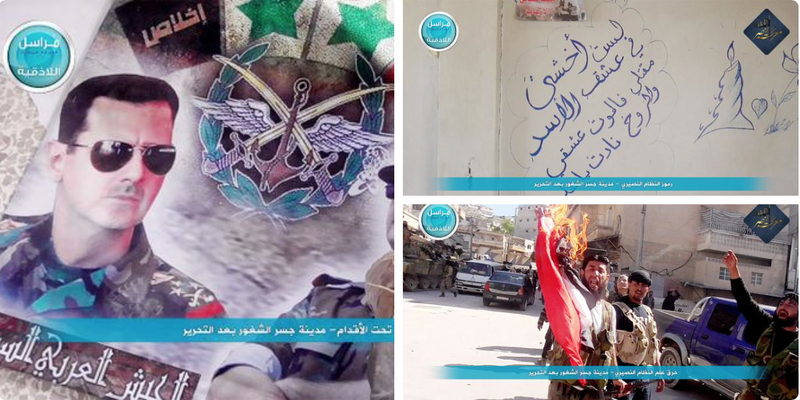 Jaysh al Islam and Ansar al Sham, two of the five member groups that founded the “Battle of Victory” coalition to take Jisr Al Shughur, have also used social media to advertise their fighters’ gains. One video tweeted by Jaysh al Islam shows its fighters firing on regime aircraft flying overhead. All of the organizations posting propaganda from the battle are using their own logos, as well as the brand created for the “Battle of Victory” alliance. 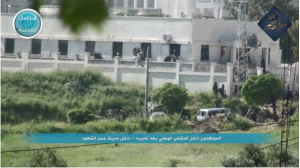 A highly influential al Qaeda-linked ideologue, Sheikh Abdallah Muhammad al Muhaysini, was reportedly wounded during the fighting. 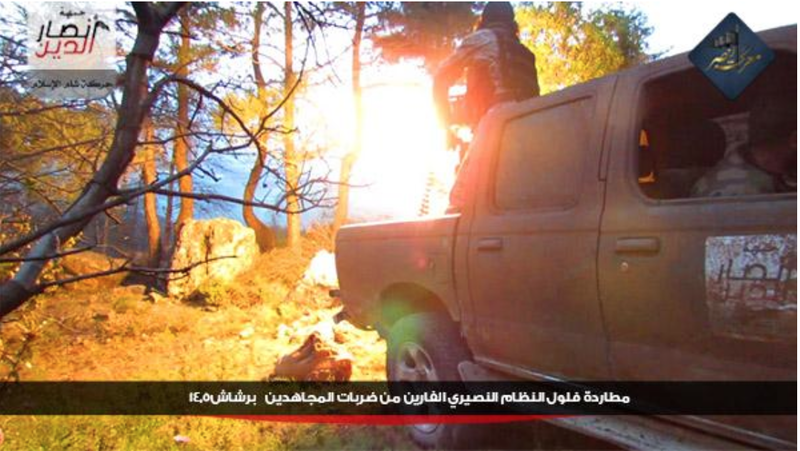 Multiple jihadists on social media asked readers to pray for Muhaysini’s recovery. Muhaysini has been a major proponent of both the “Battle of Victory” and “Army of Conquest” coalitions that have made significant progress against the regime since last month. Images from northwestern Syria have pictured Muhaysini among the jihadist fighters, with one video from March even showing him nearly being hit by a bomb in the city of Idlib. He has endorsed and advertised the jihadists’ efforts on his own Twitter page, which has nearly 350,000 followers. Muhaysini, a prolific social media user, has not tweeted since April 22, at the beginning of the battle for Jisr Al Shughur. In addition to Al Nusrah and al Qaeda-linked jihadist groups, fighters associated with the Free Syrian Army also took part in the battle. Stalemate for years, and now sudden movement… what’s changed? We don’t need to support Assad. We need to leave him alone.